Getty launched an embed tool that allows people to embed and share its images on websites, blogs and social media in a similar way that YouTube videos can be embedded, the company said. The embed capability works on any HTML-based site, and images can be shared on social platforms including Twitter and blog platform WordPress, which has about 75 million users, Getty said. The embeds are available for free for non-commercial use and will include photographer attribution as well as a link back to Getty's site, where the images can be licensed for commercial use, Getty said in a news release. This will provide people with a simple and legal way to utilize content that respects creators' rights, while it also includes the opportunity for Getty to generate licensing revenue, it added. Making "the vast majority" of its images embeddable is a way to adapt to age of self publishing, said Hugh Pinney, vice president editorial for EMEA. People are publishing and consuming imagery in a way that doesn't fit traditional licensing models, he said. 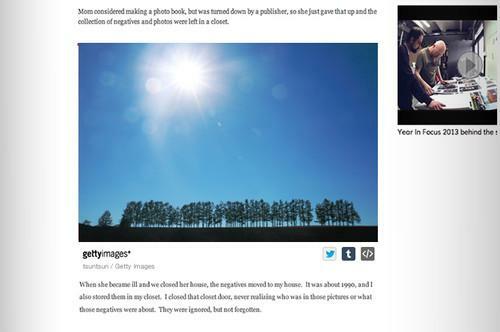 Getty lacks a presence in the self-publishing market, he said, and the embed tool is a way for Getty to evolve. The embed tool has the potential to monetize images that now are usually right clicked and saved, Pinney said. When people do that, Getty has no control over what happens with the photos. When the image is embedded though, Getty for instance gets the ability to track how, how often and where the images are being used, he said. Websites that, for instance, run Google Ads or other advertising are also allowed to start using the embed tool, Pinney said. This does mean though that those sites "surrender" the data gathered via the embeds for use by Getty, he said. Asked if users should be worried about their privacy, Pinney said: "It is not a Machiavellian enterprise at all, it is simply tracking data." For now, Getty will concentrate on scaling up the platform before deciding how exactly to monetize this new feature, said Pinney. Perhaps within six months, Getty will have a better view on how to do this, he said, though he added that the company didn't set a time frame for when to start monetizing embed usage.